Picking up lunch in a restaurant, taking a trip to the zoo or spending the day at an arts and crafts workshop are effective ways of keeping the kids you watch entertained and away from the television, but they also cost money. In most nanny/employer relationships, there is a petty cash arrangement in place to ensure that the nanny is able to pay for all of the daily expenses related to the care of her charges without dipping into her own paycheck. While making sure that kids’ financial needs are met is not the responsibility of the nanny, she is charged with the task of managing petty cash in a responsible and reasonable manner. These tips can help you to keep your petty cash arrangement in order and track it carefully to ensure there are no discrepancies, no disputes arise and that there’s enough money left to manage all expenses until the fund is replenished as per your agreement. Provided that you have a strong relationship with your employers and have established a certain level of trust, taking out a dedicated credit card may be the best option for handling your petty-cash expenses. This arrangement will allow you to ensure that all of the kids’ financial needs are met without requiring you to keep scrupulous records or manage actual cash, but can become problematic if either party fails to hold up their end of the deal. 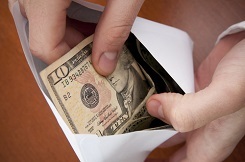 Before taking out a card in your own name and racking up charges, be sure that your employers are willing to honor their financial responsibilities. The last thing you want is to get stuck with a bill that affects your credit rating while you’re waiting for your employers to reimburse you or pay off the balance. The same apps that you use to keep track of your personal expenses can work for the management of petty cash, especially if you’re given a set amount of money and expected to keep your expenses within a strict budget. Look for apps that allow you to take notes or keep detailed records, so that you’re able to account for any money if you’re requested to do so by your employers. Unless your relationship with your employers is governed by an unprecedented level of trust, they will probably want to see where the money they give you is going and how it’s being spent. Including a daily breakdown of expenses and enclosing receipts to corroborate them with your daily nanny log entries is a great way to keep them abreast of all purchases and to account for the money that you spend. After all, a petty cash budget is intended to ensure that the kids’ needs are met, not money that goes into your pocket at the end of the day. If you know how much money you’ll be receiving at the beginning of the week, sit down to create a comprehensive budget so that you’re not running dangerously low at the end of the period. This will not only help you manage the funds effectively, it will also allow you to build a structured schedule before heading into each week so that you have everything well-organized and prepared. On occasion, you will probably find that more expensive events are on the bill. Before signing the kids up for a pricey workshop that’s out of your petty-cash budget, make sure you clear it with your employers. Don’t plan a trip to an expensive amusement park and get the kids excited about the prospect if you haven’t obtained approval, and make sure that there will be additional room in the budget in the form of a temporary increase for the event in advance. Many nannies today aren’t the only household employee working in a home. It’s not unusual for a family to also employ a housekeeper, a household manager, a cook and other people to help them manage the day to day tasks that come with running a home and caring for a family. While having a co-worker can be a welcome relief to the isolation that often comes with having a household job, it can be challenging to work alongside other employers in the home environment. Here are some tips for being successful when you’re part of a household staff. Keep the terms of your employment to yourself. One of the quickest ways to cause problems with other staff members is to talk about how much money you make, what your last bonus was, how much paid vacation you get or any other terms of your work agreement. Even if your contract doesn’t state it directly, you should consider this information confidential between you and your employer. Mostly likely, some staffers are paid more than you and some are paid less. Those side by side comparisons only lead to hurt feelings. Treat everyone with respect. Even in a private home, there’s a hierarchy in place. Someone has to be the boss. That may be the parent, the lead nanny or the household manager. Regardless of who you officially report to, treat all of your coworkers with respect. It can be easy in private service for people to feel that their job isn’t as important as another’s. This feeling can lead to unhealthy relationships. Treating everyone with respect for the hard work they do and the contribution they make, whether that’s scrubbing the bathroom or caring for the baby, will create a much happier work environment. Don’t tell others how to do their job. It’s easy to see how someone can improve their performance when you’re standing on the sidelines. However, unless it’s part of your job description to manage the staff, it’s not your job to offer unsolicited advice on how the housekeeper, your co-nanny or other staff members should be doing things differently. You’re not privy to the instructions they’ve been given by your employer, and even if you feel confident your employer would agree with you, it’s still not your place. Because the professional boundaries in a private home are less defined to begin with, it’s especially important to abide by the ones in place. Conversely, offering suggestions when asked or providing key pieces of information the person needs to do her job well are part of being a good team player. Avoid the gossip trap. Gossip is something that happens at every workplace. It’s not something that’s unique to the private service industry. However, because you work in a private home and maintaining confidentiality is part of your job, gossip can be a job killer. It’s easy to fall into the trap of commenting on what’s happening with your employer or repeating what another employee has told you. These innocent comments can quickly grow into destructive rumors and threaten your professional integrity and reputation. The best policy is to steer clear of gossip altogether. Don’t comment on your employers or co-workers, don’t repeat things that you’ve heard and don’t participate in conversations where gossip is center stage. It’s up to you to set strong boundaries in this area. Be a team player. When you’re working with others in a household, everyone’s job is dependent in part on the other staffers. 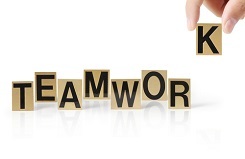 By working together, you can all do a better job and get tasks done more easily and effectively. Ask others how you can help and support them. Ask for help in return when you need it. Keep others in the loop on issues that will directly affect them. Keep the lines of communication open so others have the information they need to get their job done and to support you in yours. Don’t add more work to another’s job. In a private home, often a staffer’s job description will include serving the family and also the nanny. However, this is a benefit provided to you, so take great care not to misuse it. If you have a housekeeper who cleans the nanny’s quarters too, make sure that your area is tidy and ready for her to clean. It may be her job to pick up the parents’ clothes off the floor, but it isn’t her job to do that for the nanny. If you have a chef who cooks your meals, make sure you offer suggestions when he asks and eat at time that doesn’t take away from his other duties. He’s on call for the family, but not for other staffers. Working in a staffed household can be tricky. By keeping a few key rules in mind, you’ll be a welcome and important part of the staff. While most parents have lofty goals of raising noble, honest children that never bend the truth or withhold information, it soon becomes apparent that the occasional white lie is necessary. When kids are young, they often lack the social awareness that’s required in order to filter inappropriate comments from the more socially accepted observations. Asking kids to keep secrets, however, can be a problematic slippery slope of sorts. There are some secrets you just don’t want to ask your kids to keep, for a variety of reasons. “Don’t Tell Your Father I Gave You a Cookie” – When your little one is begging for a sweet treat and your partner is less eager to indulge those whims, it feels harmless to let her scamper away with snacks in hand and an admonishment to keep quiet in her ear. What you’re actually doing, however, is establishing a household culture in which one parent is kept out of the loop, effectively sending a message to your child that doing so is perfectly acceptable. “Don’t Tell Your Sister That There is No Santa” – Part of the magic of childhood is believing that a portly man in a red suit comes plummeting down the chimney each winter bearing gifts. As with so many things, however, that magic begins to fade as kids get older and start questioning the veracity of such tales. Asking your older child to “keep the secret” is essentially asking her to be complicit in a lie, something you’re probably actively discouraging in other situations. Instead, try explaining to her that Santa Claus is a symbol for loving and sharing, and that now she’s old enough to help continue that tradition. “Don’t Tell Your Mom I Let You Watch That Movie” – Just like keeping a secret about sneaking snacks into waiting hands can backfire, so can asking older kids to keep mum about exposing them to something that your partner might find inappropriate. This pits you as the “cool” parent against the more strict parental figure, which causes your child to make allegiances, rather than respecting the rules. “Don’t Tell Your Teacher That We’re Going on Vacation” – It’s often easier to take kids out of school on a Friday for a long weekend jaunt by feigning illness, but it only introduces your child to the concept of playing hooky. Instead, swallow your pride and admit that your child isn’t ill, she’s just going on a short vacation. “Don’t Tell Your Grandma That Mom and Dad are Fighting” – Marital discord is never an easy thing to manage, but it becomes even more complicated when your own parents or your in-laws get involved. That’s why it’s so tempting to ask your children to keep quiet about trouble in their household, but the last thing you want to do as a parent is to remove a trusted confidant from your child’s support network. It’s better to be honest about the situation and firm in your refusals to discuss the matter with your parents or in-laws than it is to run the risk of damaging the relationship your children have with their grandparents. “Don’t Tell Your Aunt I Made Fun of Her New Haircut” – Before you realized what you were doing, you slipped and made a derogatory comment about your sister’s unfortunate new hairstyle while your child was in earshot. Sure, you can ask your child to keep the secret with no explanation, but all you’re doing is allowing her to think that it’s okay to speak ill of others in their absence. Owning up to your mistake and talking about why you shouldn’t have made those comments is a better approach. “Don’t Tell Your Friend That I Don’t Like Her Mother” – When your child starts making her own friends, it’s a given that you won’t approve of all of them. Still, you shouldn’t let your child know that you feel that way without real justification and you certainly shouldn’t share that information with her and then tell her to keep it to herself. “Don’t Tell Mom That I Have a New Job” – Divorce is a messy situation, especially when it comes to financial settlements and disclosure. Instead of asking your kids to pick sides by keeping secrets from your ex, practice honesty in your proceedings or keep the information you’d like hidden from your children’s knowledge altogether. When you’re planning a secretive party or putting together a present with the help of a child, it’s tempting to bring her in on the “secret” so that she feels like she’s part of the group and doesn’t spoil the endeavor by letting the proverbial cat out of the bag. Try framing these situations as “surprises,” rather than “secrets.” Then you’re not instilling a sense of distance or setting a precedent for withholding information, and your carefully laid plans won’t be spoiled by an innocent mistake. One of the most important skills for an adult to have in order to successfully manage her life and achieve independence is a strong grasp of how to effectively save and manage money. Unfortunately, this is also a skill that many parents find difficult to pass along. In the interest of helping your children grow into financially independent adults that know how to spend money responsibly, it’s essential that you begin instilling these skills at a young age. These hints can help you build the foundation for money saving habits, helping to ensure that your kids gain the skills they need to see them into the future. It’s tempting to give in to kids’ requests for big-ticket items, but you’re running the risk of instilling a sense of entitlement and passing up a valuable opportunity to foster strong money management skills by giving in to their whims. Instead of rushing out to make a pricey purchase, talk to your child about ways that he can save the money himself and then help him to reach that goal. Many kids operate best when they have a tangible end goal, rather than a vague idea of saving money “for a rainy day.” This also helps kids to understand the importance of not buying things they can’t afford, which can lead to dangerous credit over-extension later in life. Giving kids an allowance is a time-honored tradition, but you can help your kids learn valuable money saving skills by insisting that a certain portion of their allowance be saved, while the rest is available for spending. When the habit of automatically setting some money aside is established early, the concept of saving as an adult isn’t so difficult to wrestle with. This also simulates the experience of paying bills and managing expenses, making that experience a less traumatic one than it would be if those lessons were learned in young adulthood. Older kids may love watching the numbers in a bank statement climb, but little ones will respond better to concrete representations of their amassed wealth. Use transparent jars as banks, and actively try to generate excitement as those jars are filled with cash. Depositing the lump sum into a savings account later will help to teach account management, but watching their stash physically grow will be more exciting when your children are too young to adequately grasp the concept of a bank balance. From talking about big sales to discussing unit price, there are a plethora of opportunities in everyday life that present themselves for the teaching of savings skills. Talking to kids about living frugally and setting money aside is easier when you’re discussing the concept you’re demonstrating. Remember, kids learn more about the world from observing their parents and other trusted adults than most people realize. Discussing how much things cost can also give kids a more realistic view of money as a tangible object in finite supply. While younger children will respond best to watching their money physically grow, older kids need to learn the essential skills that are required to successfully maintain a balance in their bank account. 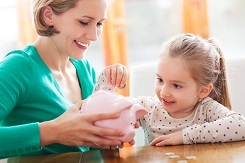 Take your child to the bank and discuss the options for savings accounts while he’s there to listen. Walk him through the basics, and make sure that he understands that you’re there to help him. You may be surprised at the insightful questions he asks about account management. In order to truly learn about financial responsibility, kids need to have some measure of independence over their savings. This means that you’ll have to allow him to make a mistake or two in order to learn from them. Don’t berate him for mistakes or jump to bail him out of the mess. Instead, take the time to talk about what went wrong and how to fix the situation responsibly. Remember that every mistake is a learning experience for your child, especially when it comes to money management.